If you see discrepancies among the Assets, PrivateAssets, and AssetLibrary folders on the server, synchronize the folders using the Rebuild Asset Library utility. The Rebuild Asset Library utility rebuilds the Asset Library using the data found in the Assets and PrivateAssets folders. 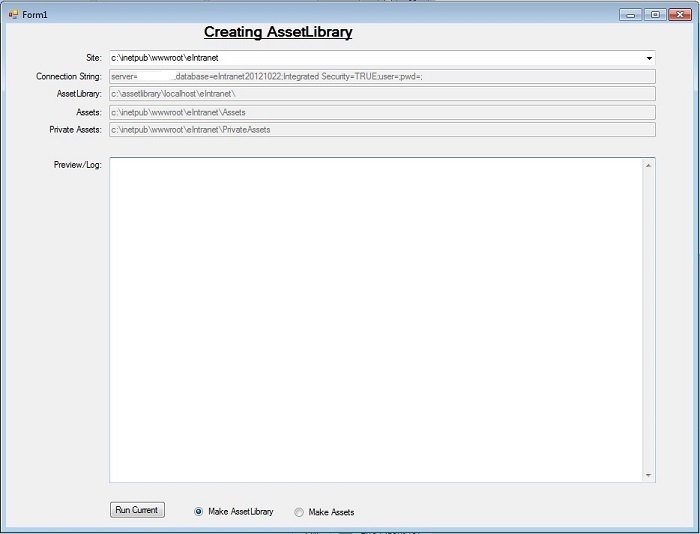 It also can rebuild the Assets and PrivateAssets folders based on the AssetLibrary. Create a copy of your Assets folder located in your site root. Create a copy of your PrivateAssets folder located in your site root. While this utility should not negatively impact your site, Ektron recommends that you run the utility on a production environment during a maintenance window of off-peak hours because there may be some latency associated with the process if you have a large amount of assets. IMPORTANT: There are 2 versions of the utility. Choose the link that applies to your server. Rebuild Asset Library utility for servers with .NET 4.0 and earlier. When you run the utility, the following screen appears. Click Run Current after you fill in the fields. Site - Select the site on which to run the utility. The fields automatically populate with your selection but you should confirm that the values are correct for your site. Connection String - This value automatically appears from web.config, where you can confirm it in your site root folder. Assets - Found in your site root folder. PrivateAssets - Found in your site root folder. Make AssetLibrary - This is the global option. When selected, the main AssetLibrary will be modified and remade affecting everything in that folder including asset history. Make Assets - This is the local option for specific site wide issues in the assets and private assets folder. NOTE: You might find it helpful to run the utility with Make AssetLibrary , and then Make Assets . Errors are reported in the Preview/Log section. When the utility is running, assets used on the site will not disappear or fail to load. Everything remains in place as it was.